It occurred to me recently that my blog's birthday might be coming up soon. I looked today and today is it! Happy birthday 2 year old sewing (with the occasional mention of bicycling) blog. Late March also means the beginning of long sleeve weather round here. 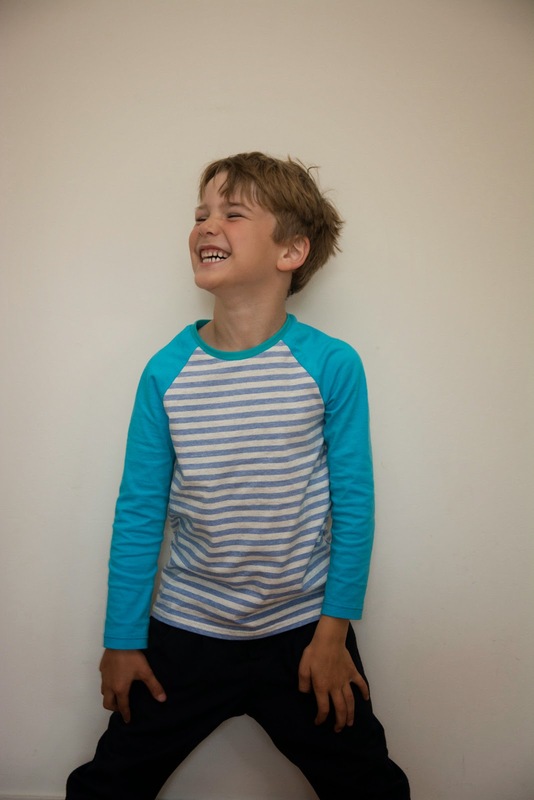 So I whipped up a couple of Field Trip Raglan Tees for the boy kid. Size-wise I went with my usual method of not measuring the kid but choosing something I'd already traced and adding length (la-zy!). So this is the size 6 with about 1&1/4" extra length at the sleeves and hem. But look at the arms on monkey-boy! Seriously, those are like the size 8 sleeve lengths. The fabric for this one was some of the striped knit leftover from the Robert Morris sculpture T-shirt and an aqua knit that probably came from Brunswick fabrics or similar. The aqua didn't have much recovery and I wasn't game to use it for the neckband so I used a bit of the aqua/teal Ottobre ribbing that I'd previously used here. It's not a perfect colour match but he moves around enough that no-one's going to notice! Same size, same length additions. Obviously it would pay to make one and try it on first, but I was on a late night roll. Next time I'd add even another full inch to the sleeves to get more than 2 months wear out of them. The pocket was some grey knit leftover from my first Camas blouse and the neckband a ribbing remnant from Milo's knight hoodie. I think the trick to the neckbands is not to even attempt using the main fabric unless it's a nice jersey with good recovery. These cotton interlock type knits just don't bounce back enough for neckbands. "Hey mum, take this picture... 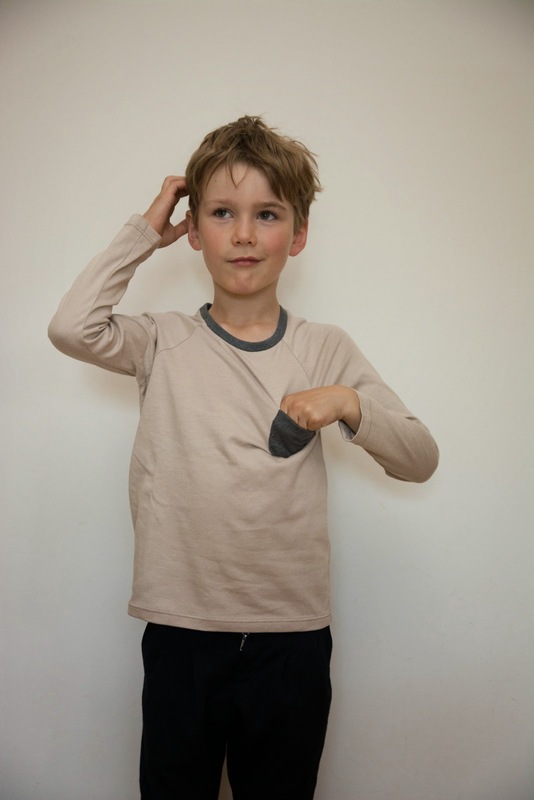 I'm going to feel in my pocket and look like I'm wondering what it is that's in there"
This is such a great pattern for a quick, easy T-shirt. 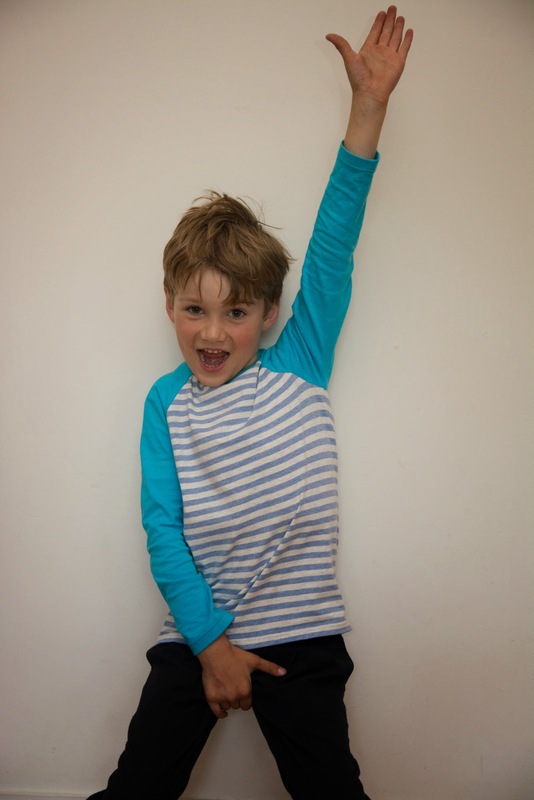 The raglan sleeves are very easy to sew and I experimented by not using any pins. I'm usually a pin at least every few inches kind of sewer and since my new year's resolution was not to stitch over pins, and I have the absolute horrors of running over one with the overlocker knife, I thought I'd try without any. The fabrics were suitably "sticky" and stable such that it was easy-peasy. Only in attaching the neckband did I use pins. 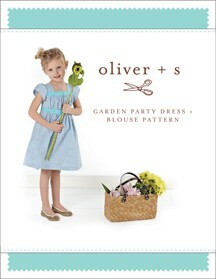 To celebrate the blog's second birthday I'm going to spread a bit more Oliver + S love and give away a paper pattern. I made this gorgeous dress pattern here and I can't say enough how lovely it is to sew! I have another virgin, unopened copy of the Garden Party dress in sizes 6M to 4 years that I'm happy to post anywhere. To win the pattern use the Gleam widget below, no need to "like" anything, just confirm that you meant to enter by leaving a blog comment too. Congratulations with your blog aniverserie, lets see if I can be lucky twice ! Happy blogaversary! He looks like he's having so much fun! Hope the vomiting 4-year old recovers quickly! Happy anniversary! This shirt looks like a great staple. I'm itching to be out of long sleeved weather over here, but I think my kiddo will need on more pair of long pants yet. Dang end of season growth spurts. Happy anniversary! I love this pattern! Happy blog anniversary. Those monkey arms remind me of my brother and trying to get a jacket made for him. Please don't include me in the giveaway. Ha! I started blogging in March too;) I love this pattern, as you know. Yours look great, I love the stripes. Happy blog-birthday. I love the bright colours of the aqua top, and Monkey-arm-boy looks gorgeous in both of them. R is much too big for the garden party dress, but I'm sure you'll find a worthy recipient! Happy 2nd birthday to you and your blog. After hearing and seeing so much about this pattern I am ready to try it for my granddaughter. Thank you. Happy blogging anniversary! 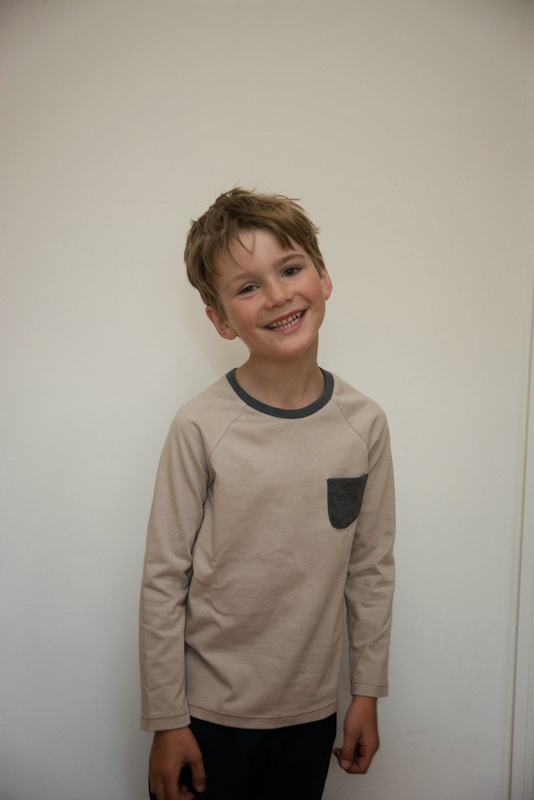 And I love, love, love that top raglan shirt! What a fun color combination. Look forward to all your sewing in year three! Hehe I love your little Jacko! So cute. Happy blog birthday, Shelley!! I am so glad you started blogging, you're always a fun read. Congratulations on the anniversary! 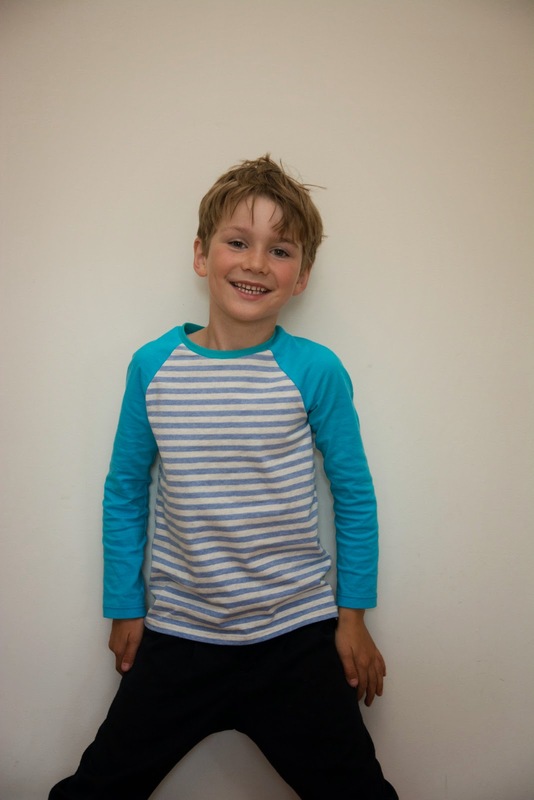 I recently purchased the Field Trip raglan pattern, but am yet to try it out. Will definitely have to do it soon, it's starting to get a little cool around here! Happy Happy second birthday to your blog, and what a great giveaway this is! I love the frock up there (fairy tale dress), but you know I really really am in awe of all that knit sewing--the teeshirts look fantastic. (I am also seeing that striped dress you made for yourself in those fabulous colours). Congratulations again, and happy year 3! Ooops oops...please take me out of this lovely giveaway! Child here is already 6!